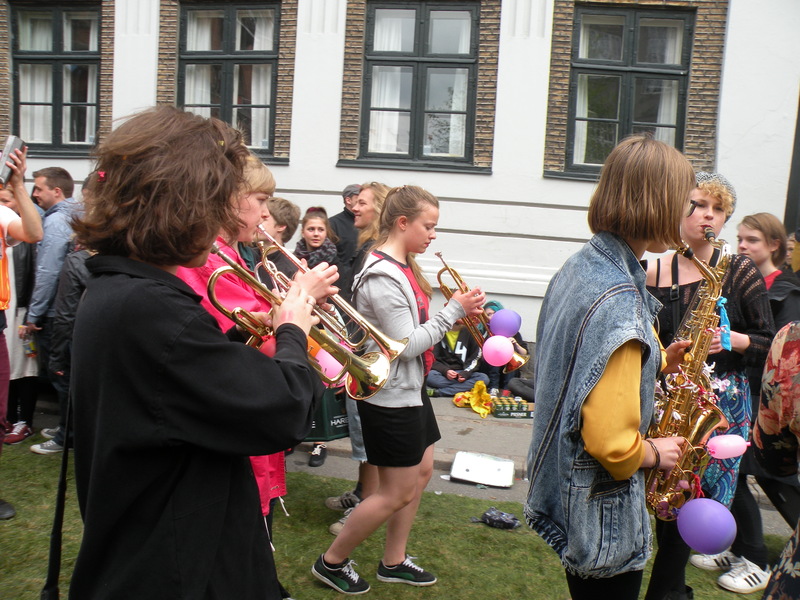 More than 30 thousand people gathered downtown this last Saturday to join Mejlgade for Mangfoldighed’s. A festival that has already become a tradition of the city. “I need an African man… a strong black man”: the music is playing loud in front of Saint Clements Cathedral. A big stage is placed in the middle of the street and in fact, a strong black African man with long dreadlocks is holding another two on top of his shoulders. 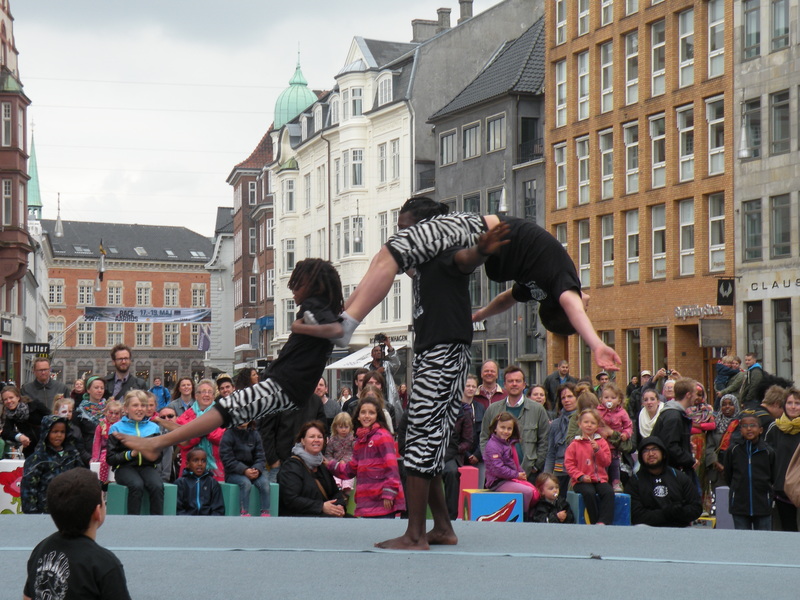 It is the group Cirkus Tvaers, a grassroot organization from Gellerup which works in social integration of young people while juggling and doing acrobacies. “Learning to jump on top of your partner and let him hold you above his head is part of learning to trust each other; no matter where you are from or how old you are.” That’s the aim of the group according to one of the mentors. Cirkus Tvaers is one of the different social organizations that have got in touch with the festival organizers to be part of the diversity party. Among the performances, also a group of Palestinian teenagers performed traditional dances, dressed in the colors of their flag in the very same stage. And the Kucheza Aarhus Steel Band, performed to finish the street parade. There is room for everyone at Mejlgade for Mangfoldighed’s. As in the past eight years, again the city turned into a massive outdoor party this past Saturday. Mejlgade, one of the oldest streets of Aarhus, has become famous because of this yearly event. The festival began in 2005 as a response to a series of racially motivated attacks and it has been passed on from different groups of organizers every year, turning into an urban tradition hard to trace back to the origin. Diversity was exactly the concept that gave birth to the celebration. 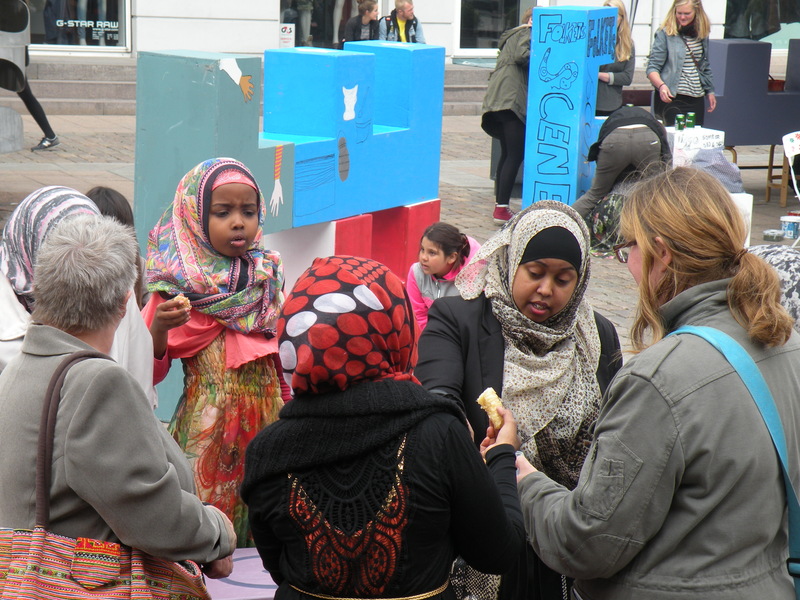 According to Esben Kjaer one of the initial organizers the whole idea was to bring people together: “by the time we started it, there were all these different subcultures each hanging out separately in their own backyard – the point was to organize something where they could meet each other”. He was 17 in 2007 and decided to turn a small street party that had been going on for two years into a diversity demonstration. He recognizes that Aarhus seemed a “little boring and closed-minded” for him and his group of friends studying at Kaos Pilot enterpreunership school. Being gay and part of the artistic and musical scene, the best idea seemed to do something about it: bringing every input together, excluding no one. “Given the neonazis attacks to caffes and other places, we started talking with social institutions in the streets, but the mainstream discourse was basically anti-racist – anti, anti, anti. We wanted to show that we are not only anti-racist but also normal and creative people”. So, the tradition was created: recognizing the ideal of celebrating differences from each other, altogether. But who organizes it and takes the responsibility every year? Loyal to its ideals the celebration belongs to the people, and so they are the ones in charge. There is no official institution behind it, it’s a self sustained, entirely free and by volunteer effort organised event that passes on to different groups every year. Most of them are students and some of them related to Kaos Pilot, but no matter who you are or what you do everyone is invited. Volunteers are the key. Dozens of them were seen during the whole day, making shifts to try to give information to the visitors and keep everything running. And even with the difficulties of having new people taking over every year, the task is achieved out of willingness. Standing behind the wooden information counter and after 12 hours of work Tanjia´s words sound clear and strong: “People are getting together because they are highly motivated to keep this thing going”. That is why also the essential concept of having new people in charge every year, means in a way that there is a new festival every time, she says. And the magic is how it is created and recreated. The name and the frame have already been set up and they seem to be in Aarhus to stay for life. Even when Esben and some of the initial organizers feel that the festival has lost some of its cultural and political significance, the managers of this year highlight that they are doing all that’s possible to recover that. “We are trying to change the image from it being only a massive street party and really put the diversity on it”. This year the activities started at noon and not even the rain scared the people off the streets, when drops watered the grassy streets after 10 pm. Art exhibitions, dancing, jazz, poetry slams, boat building, diversity dialogues and various bands and Dj´s encompassed the rhythm of the visitors no matter their age, nationality, race or religion. 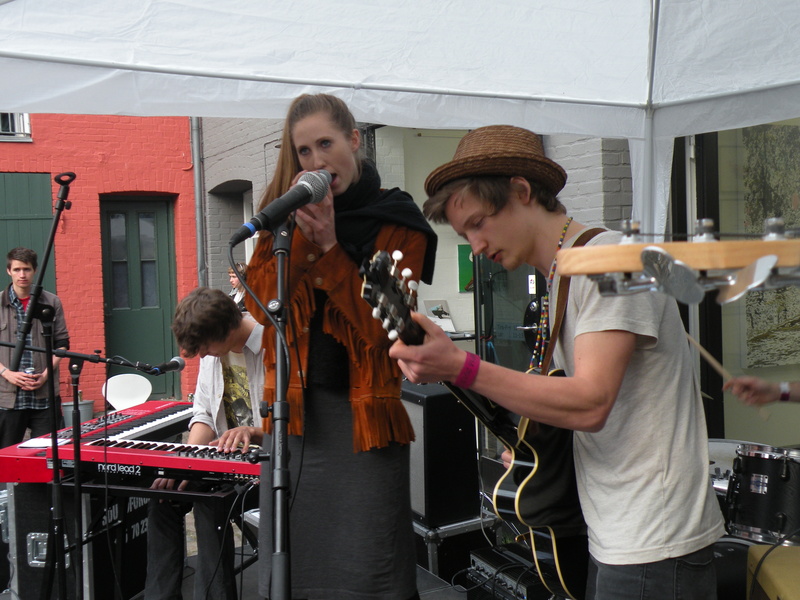 200 hundred people were part of the first party in 2005, around 10 thousand showed up during 2007, 2008 and 2009 when Esben and his friends turned it into a cultural festival. And more than 30 thousand gathered in Mejlgade street this year. The event has been growing in visitors and popularity, and the organizers and activities changing constantly, but the essential concept remains the same: a diversity celebration for the city and by the city that will continue to pass on from generation to generation.